Are they stars? Are they lost planets? Brown dwarfs, the galaxy’s dark, wandering orbs, are some of space’s most perplexing features. They’re larger than Jupiter but smaller than stars, glow on their own and, well, they’re just really strange. A new analysis seems to explain at least a few of their mysteries. An international team of researchers sifted through telescope data to try and understand the mysterious behavior of brown dwarfs’ light emissions. After watching a large sample of cold brown dwarfs for a year and a half equaling around a thousand rotations, they came to what might be a surprising conclusion: The best-fit model for their data turned out something that looked a whole lot like planet Neptune. This could have important implications not only for studying brown dwarfs, but for understanding exoplanets in general. “Our results suggest that large-separation gas giant exoplanet candidates [such as HR 8799bcde and HD 131399Ab],” these well-known exoplanets really far away from their parent star, “which have near-identical temperatures to the brown dwarfs studies here, may also show banded circulation,” the scientists write in the paper published yesterday in the journal Science. One of the brown dwarf’s mysteries centers around its light-curves, that is, how much light it emits over time. Researchers have noticed confusing patterns, including peaks splitting into two recurring peaks, quickly-brightening blips, and patterns appearing in what looks like randomness. After collecting data from the Spitzer Space Telescope, specifically from the extended missions after it was meant to be decommissioned, the researchers came up with some best-fit models. Those include some features you’re probably already familiar with, including bands of varying brightness and round, bright spots. In fact, the scientists think that brown dwarfs might look a lot like Neptune. In other words, maybe the best way to explain these dim, star-like things is with the physics of planets. 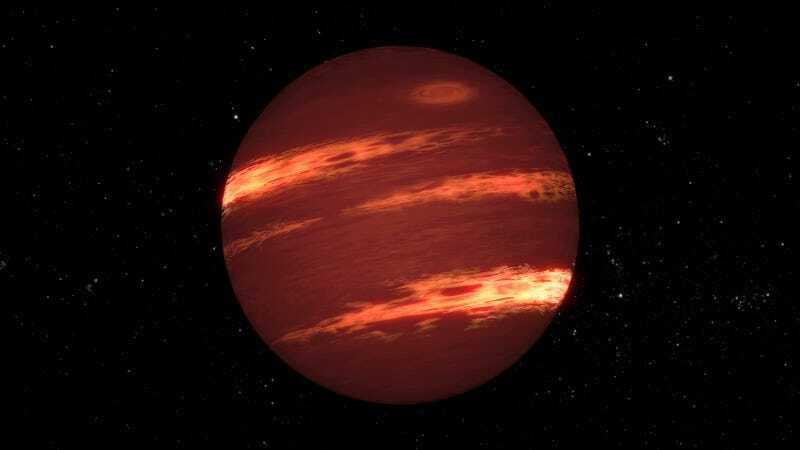 “The data for each brown dwarf can be modeled with two or three bands,” the authors write, with waves of varying brightness kind of like a jet stream with and maxima and minima of light instead of air temperatures and pressures. Rice was especially excited about the fact that the data came from extended space missions. “When the space mission launches but you don’t know when it’s going to end, you never know how much data can come out of it,” she said. There are plenty of other implications for brown dwarfs’ atmospheres looking like those of planets. Stars form from clouds of dust, while planets form from disks of dust orbiting stars, said Rice. Brown dwarfs show that something that formed the first way can end up looking a whole lot like the second way (though the elemental composition is different). That also means that studying brown dwarfs can likely help explain many of the specifics of exoplanets, which are generally more difficult to study given the blinding light of the parent star so close by. What are millennials killing today?